Pausing an XDCR replication temporarily suspends the replication of data from the source bucket to the target. The examples in the subsections below show how to pause the same replication; using the UI, the CLI, and the REST API respectively. As their starting-point, the examples assume the scenario that concluded the page Create a Replication. Step 1: Access Couchbase Web Console. 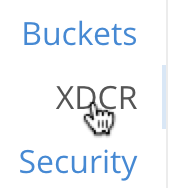 Left-click on the XDCR tab, in the right-hand navigation menu. This shows the single replication that is in progress. Note that the status column displays a status of Replicating, immediately adjacent to which is a pause symbol. From the starting-point defined above, in Examples on This Page, use the CLI xdcr-replicate command to pause an XDCR replication as follows. 570d0ca2db3b1e128e2fafd362a1bfd4: The uuid of the reference. travel-sample: The name of the source bucket. travel-sample: The name of the target bucket. The replication is now paused. From the starting-point defined above, in Examples on This Page, use the REST API to pause an XDCR replication as follows. The value associated with the id key is the stream-id for the replication: featuring, in sequence, the id (570d0ca2db3b1e128e2fafd362a1bfd4) of the reference, the name of the source bucket (travel-sample), and the name of the target bucket (travel-sample). For more information, see Pausing XDCR Replication Streams. Once a replication has been paused, you can opt to resume it. See Resume a Replication.